NEW YORK (WABC) -- Mayor Bill de Blasio tweeted that a school bus strike for students in Queens, Brooklyn and Staten Island has been averted. Drivers had voted last week to strike two bus companies serving 600 routes. Hundreds of drivers employed by two companies, Jofaz and Y & M Transit, had planned strike Tuesday morning if union leadership and company management didn't hammer out a new contract deal by midnight. Drivers were not happy with the prospect of higher healthcare costs and fewer holidays. Teamsters Local 553 says that all parties are pleased with the resolution and that members will need to approve the agreement. "When workers stand together, they can win good jobs for their coworkers and their families," said Demos Demopoulos, Secretary-Treasurer of Teamsters Local 553. "This was always bigger than two companies and we will continue working with our allies in the labor movement to raise standards in the school bus industry." "I am so thankful to win a contract that protects our healthcare," said Lisa Cilone, a Jofaz school bus driver. "We are proud of the work we do. 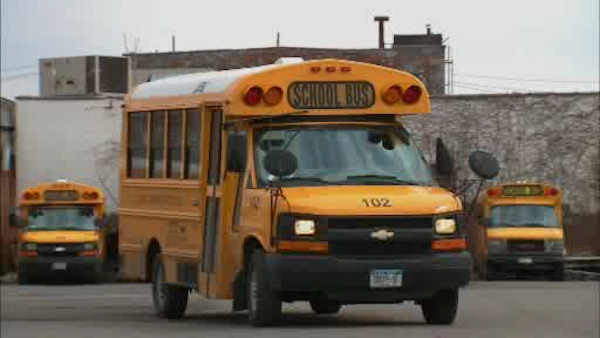 This job is important and school bus employees should be fairly compensated." The New York City Department of Education released a statement saying: "We are grateful to families and educators for their patience and support as we prepared to ensure transportation options for students."